An extensive range of flat braids from a wide choice of materials, including stainless steel, aluminium, plain copper, tin-plated copper and nickel-plated copper. The electrical performance of a braid is determined by selecting the correct cross sectional area from the table. 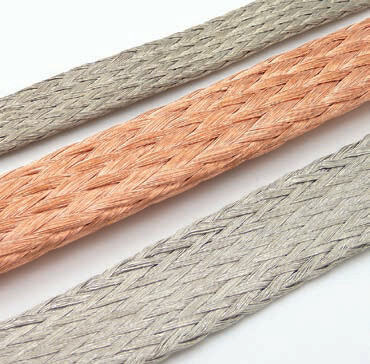 By changing the conductor strand size it is possible to improve the braid flexibility and vibration resistance whilst maintaining its current rating; the smaller the strand size, the more flexible the braid. Specialist flat braids are available using numerous conductor materials, such as using nickel and nickel plated copper for increased temperature and corrosion resistance and aluminium for applications requiring weight savings. Flat braids are also available with the option of PVC or zero-halogen extruded jackets, providing mechanical protection and electrical insulation. There are numerous options and permutations possible with the facilities available, so please contact us for additional information or to discuss your particular requirements.